When your laptop regularly travels with you, you find yourself working in airplanes, cars, trains, and even the local internet café, you realize that just about everywhere you go poses a new threat to your laptop's safety. 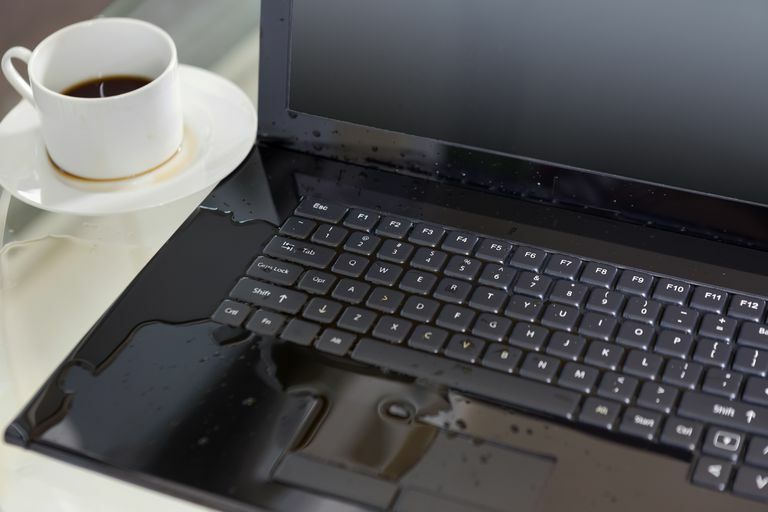 The best bet for your laptop's survival is to follow these 10 steps to clean up the spill and protect your laptop from further damage. First and foremost, turn it off. Time is of the essence here, so if need be, go ahead and do a hard shutdown. If you can, remove the battery because if liquid reaches the battery, it will short out. Next, remove any cables, external drives, removable bays, and external network cards. You don’t want your laptop to be connected to anything. Then quickly, but carefully, blot up excess liquid with a soft cloth -- preferably a lint-free absorbent fabric. Be sure not to use a wiping motion as that just pushes the liquid around. Blot up the liquid that may have gotten on the removable media. Tilt the laptop from side to side to allow the liquid to drain out. Do this gently -- do not shake the laptop. Place upside down so that any excess liquid that you couldn't reach will drain out. If you have access to one, use a blow dryer on the coolest setting or a can of compressed air to get into those nooks and crannies. Carefully dry the laptop with the cool air while still upside down to let the liquid drain. Pay special attention to the keyboard and the parts you removed. Keep the blow dryer or compressed air moving. The minimum recommended drying time is one hour, but leaving the laptop to dry for 24 hours is preferred. Once your laptop has had time to dry, reattach the removable components and start up the laptop. If it starts up with no problems, then run some programs and try using the external media to ensure that everything is working properly. If the laptop does not start up or there are other problems, it is time to take your laptop to a certified repair service. If your laptop is still under warranty, you should follow those procedures first. Unless you’re a computer professional, do not take apart the casing. This can void your warranty and you could damage internal components. Water is the easiest liquid to clean up on a laptop. It is generally a case of moving quickly to ensure water doesn’t get into the internal casing. Other liquids, especially those that are sugar-based, will make things sticky and harder to clean up. They also tend to pose a greater threat of erosion to delicate parts of the laptop than water. Use a slightly damp warm cloth to clean up sugar-based liquids and fight the stickiness.